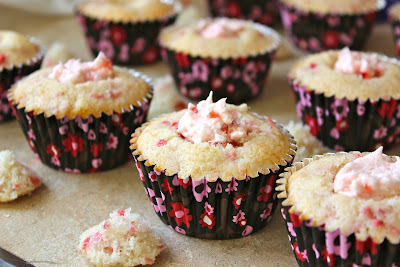 It is no secret that Strawberry Cupcakes rock my life. I seem to use this recipe whenever I can, and people request it about as often as I get requests for the standard vanilla and chocolate cupcakes. 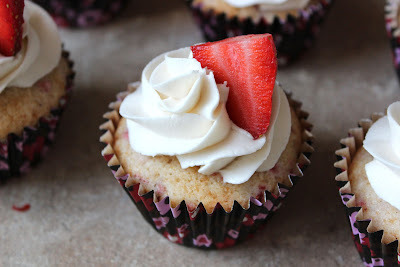 There is just something delicious about pairing a sweet and tasty cupcake with the amazing flavour of fresh strawberries. My mouth is totally watering right now. Since it isn't always easy to package up a cake and drive 3 hours with it (and 2 dogs) in the back seat, I decided to take the flavours and make some cupcakes instead. Easier transport, and easier snacking too. I halved the Strawberry Cupcake recipe so that I only had 18 cupcakes (and not 36). After the cupcakes cooled I cut out a cone from the top of each and filled them up with strawberry buttercream. 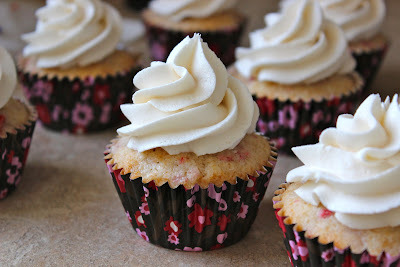 The cupcakes were then finished off with a swirl of lemon buttercream and a slice of fresh strawberry. Yum! 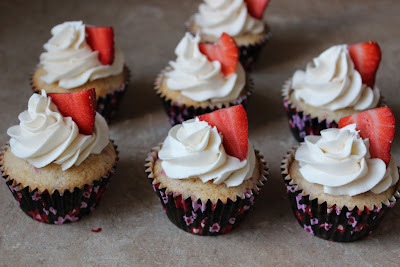 i'm totatlly with you i love strawberry cupcakes!